Endless photos of dancers in leg mounts/splits/backbends have saturated ballet-related hashtags on Instagram. I'm not just tired of it, I'm concerned. The power and influence of social media is undeniable, especially amongst the younger generation. Plaguing social media with misrepresentation of the art form is not just doing a disservice - it skews and even cheapens the public's perception of what ballet and dance really is, and engenders a warped set of values for young dance students. Ballet is ballet, just as contemporary dance is an entity unto itself (albeit in countless forms), for example, and both these art forms are a world away from gymnastics and other sports. But if you were to peruse one of these hashtags, you would see that there is confusion. There are of course some Instagram accounts that I follow with beautiful performance and studio shots (try @nikolairusser and @balletandphotos for a start) but I wish these types of accounts weren't so scarce. There seems to be zillions of accounts which are focussed on more 'likes' and 'follows'. This is part of a broader concern of mine that in an effort to gain a sense of worth - and increasingly so in this fast-moving age of the internet and social media, through the dangerous trap of seeking out more likes - art is being quantified. Quantity, not quality. Quantifying art is of course impossible (the idea of scoring a performance out of ten baffles and enrages me - more about that in an upcoming blog): art is subjective and every one responds differently to its endless manifestations. That is the greatest thing about art - it is a true reflection of the diversity of humankind. I love that so many people are enthusiastic about ballet and dance; wonderful. But I would love to communicate to them what it's really about - not immediate results, more 'likes', winning competitions, boniest bodies, higher legs, bendy backs. Let's turn that enthusiasm into something healthier, and more fulfilling in inspiration. So, I have an idea to address the imbalance, with photos of 'real' ballet. Photos highlighting the art, the emotion, the depth, the drama, the beauty, the humanness, the rawness, the joy ... DANCING, not posing. I plan on making this a regular feature on my Instagram, and I will also feature the photo here. Follow the hashtags #realballet and #realdance. 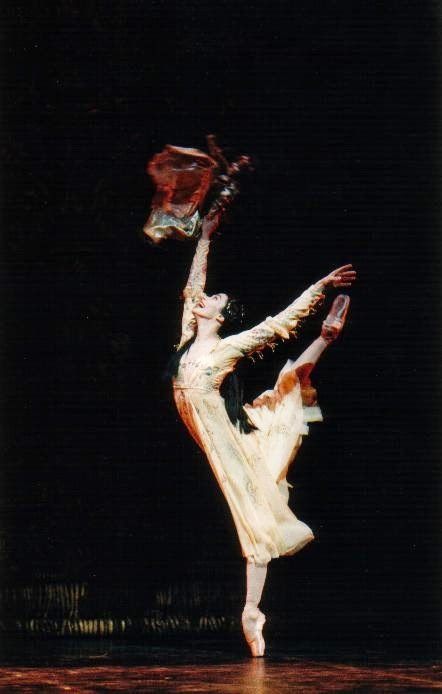 I will kick things off with a photo of my inspiration to become a dancer: Italian ballerina Alessandra Ferri. This is her as Juliet. I had this photo on my bedroom wall as a young student - my imagination and dreams captivated by the truth of her joy and effervescence. Until I saw her dance, when she guested with The Australian Ballet in Onegin, I had no idea that ballet could have such dramatic and expressive possibility. That is when the tune within me changed. I had a video of an American Ballet Theatre gala in which she and Julio Bocca danced the famous balcony pas de deux from MacMillan's Romeo and Juliet. It was a very, very well-worn tape. Some ballet experts would criticise her classical technique in this photo - that her supporting leg is turned in, that her attitude leg is also turned in. I don't give a damn. To me, she is perfect. Please use the hashtags #realballet and #realdance on Instagram, or you can send me your favourite photos of real ballet or real dance either via Instagram message or even Twitter (both @julietburnett) or by leaving a link to the image in the contact form at left. Let's show the world the richness and integrity of the art of dancing! Oh, and if you follow any Instagram accounts that fit the bill, please share your suggestions in the comments below. Fantastic idea! I can't wait to see all of the pictures you put up there. I also can't wait to read your next post on subjectivity; admittedly, I don't agree with your comments, but I really want to see what arguments you make. Apropos social media; I don't imagine that it can do anything to devalue art. But what it can do is alter our experience of it. And I think the running theme here is that we can never fully experience anything anymore. Our attention is divided, and like you suggest it is no longer about the dancing, or the pure enjoyment of dancing, and this applies to all aspects of life. I completely agree! I'm tired of the extremes they are taking ballet - 360 turnouts and 360 oversplits, who cares! I don't want to see technically perfect ballet performances that leave me empty and unscathed. I want to bawl my eyes out when I watch Romeo & Juliet, I want to be at the edge of my seat watching Mayerling, feel the magic when watching Alice, Nutcracker, whatever. Give me emotions, that's what I come for (and still find). I'm far away from Australia, but I've been following Behind Ballet for quite some time, and I'm so happy and excited that you decided to start your own blog! Also, I can't wait to see your class and rehearsals October 1!! !